Britain has sought to play down the visit of Israeli Prime Minister Binyamin Netanyahu as he arrives in London to commemorate the centenary of the Balfour Declaration. The colonial-era document signalled British support for the creation of the Jewish state. The declaration, written by Britain’s Foreign Secretary Arthur Balfour during the First World War, expressed the government’s support for “the establishment in Palestine of a national home for the Jewish people.” Israel and Jewish communities elsewhere view the pledge as momentous, while Palestinians regard it as a historical injustice. The UK has rejected calls to apologize for its role. Labour leader Jeremy Corbyn, a long-time critic of Israeli policy towards the Palestinians, declined an invitation to attend the dinner with Netanyahu. He is sending shadow foreign secretary Emily Thornberry in his place. In a speech to be delivered at the dinner, May is expected to call for a “renewed resolve” to achieve a lasting peace between Israel and Palestine, and hit out at a “new and pernicious” form of anti-Semitism. “There is today a new and pernicious form of anti-Semitism which uses the criticism of the Israeli government as a despicable justification for questioning the very right of Israel to exist. This is abhorrent and we will not stand for it,” she will say, according to the Press Association. May will also hold talks with Netanyahu in Downing Street, where she hopes to make clear Britain’s continuing support for the nuclear deal with Iran, despite US President Donald Trump’s disavowal of the agreement last month. 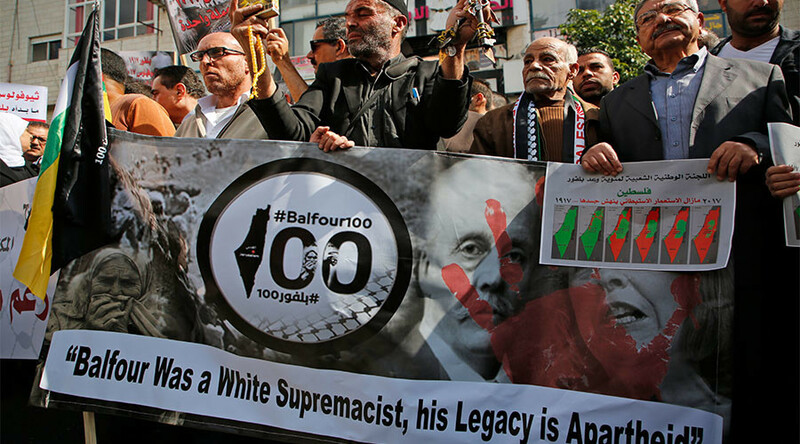 Palestinians and their supporters will be marking the Balfour centenary with protests. 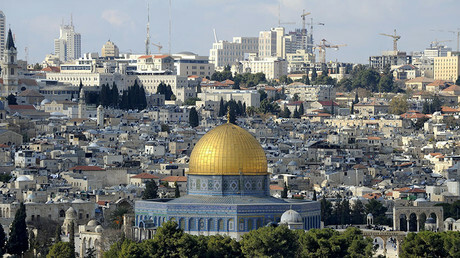 Mahmoud Abbas, the Palestinian president, has called on Britain to apologize for the declaration and revoke it. A minute’s silence will be observed in Palestinian schools.